Hundreds of Northwest Airline mechanics are ready to walk off the job in Duluth Friday night. Northwest's Duluth maintenance base services the airline's fleet of Airbus airplanes. In the event of a strike, Northwest is expected to close the base. But, that could violate an agreement between the airline, the state, and city of Duluth. Duluth, Minn. — Dennis Kaminski is secretary for the Aircraft Mechanics Fraternal Association Local 35 in Duluth. This week, Kaminski's been at work, servicing Northwest Airline's Airbus jet aircraft. Kaminski expects to be on a picket line early Saturday morning. "Well, we will picket at the terminal," Kaminski says. "And we'll have a presence at the terminal pretty much all day every day. And we will picket this hangar; and this property; and hopefully discourage the remaining workers that are here from coming in. We'd like them to not cross the picket line." In the event of a strike, the Duluth mechanics hope to keep baggage handlers, reservation clerks, and stock clerks off the job as well. Northwest's Duluth base has two maintenance lines, employing 350 mechanics. "Our director, Todd Johnson, has told us since the beginning of the 30 day cooling off period, that this facility will be closed, Friday, when we go on strike: Friday at 11:01 p.m.," says Kaminski. 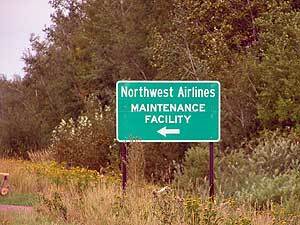 A statement from Northwest Airlines says the airline hopes to reach a consensual agreement with the mechanic's union; but in the event of a strike Northwest's plan is to have all heavy maintenance done by 3rd party vendors. The Duluth maintenance base opened in the mid 1990s; part of a public financing package to keep the airline solvent. The Duluth base was built largely with public bonds, backed by the city, which retains ownership. The agreement requires Northwest to provide 350 jobs in Duluth. When the airline laid off mechanics a year ago, base employment dropped to 250. City officials complained, and early this year, Northwest returned 100 mechanics - hired as temporary workers. Kaminski says those workers are about to lose their jobs. "We were told they would be let go this Friday, before the strike," Kaminski says. "We haven't seen paperwork on that, but that's what we were told." City officials have been watching strike developments closely. Tom Catruvo is Duluth's city business director. Catruvo worries about the financial hit of losing 350 mechanics who earn an estimated $65,000 or more a year. We will picket at the terminal ... and we will picket this hangar; and this property; and hopefully discourage the remaining workers that are here from coming in. "You know, we've obviously built a significant aviation community, and Northwest Airlines was one of the early projects that lead to that creation of that community," Catruvo says. "And, they're vital to our economy." Close to a third of the mechanics have been on the job just since January, when city officials persuaded Northwest to honor its hiring agreement. Now, the agreement could be violated again. City officials haven't prepared a response. "We haven't discussed it, but obviously we would be disappointed if there were not work going on at the airbase," Catruvo says. "You know our biggest concern would be that the people that are working there would not have employment." Northwest provides Duluth a mix of air connections between Northwest, Pinnacle, and Mesaba airlines. There are seven flights daily between Duluth and Minneapolis, and two with Detroit. Airport officials say regularly scheduled flights will continue despite a strike. Brian Ryks is manager for the Duluth Airport Authority. "They've informed us that they do not plan any flight reductions in Duluth," Ryks says. "So we are going on the assumption that our full flight schedule will remain intact." Ryks says he expects the same connections, including Northwest passenger jet service. But Ryks is concerned about a strike and about Northwest's long term financial health. "You know, since 9-11 we've had concerns and issues all along," says Ryks. "The threat of bankruptcy is real and it's possibly imminent. But, I would expect that if bankruptcy comes along that they will continue to operate and we would continue to have scheduled air service in and out of Duluth." What's unclear is whether Duluth passengers will wait to see if service continues without interruption. A Duluth travel agent reports a surge in recent weeks of customers booking with other carriers out of the Twin Cities.